Like Robin Williams and nearly every gamer over the age of 25, I have fond memories of playing Ocarina of Time on the Nintendo 64. 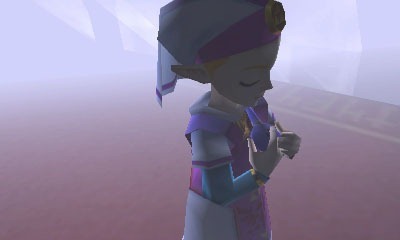 It was the first fully 3D Zelda adventure game and it blended combat and puzzle-solving in a narrative that was distinctly Japanese but still endearing to the American audience. In an age before internet FAQs and YouTube walkthrus, some of the puzzles and boss-battles were so hard to figure out my immense pleasure after defeating Ganondorf in the final moments hasn't really been equaled since. After fifteen years of pedestal-putting - Ocarina of Time is still considered the most highly rated videogame ever made - Nintendo made a gutsy move by revamping the graphics and rereleasing the game for its handheld 3D system. Could the shiny 3D, improved textures and the few helpful mechanics of the remake live up to the glee that the original delivered? 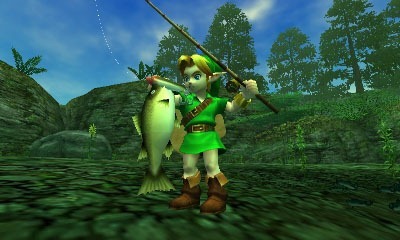 Shigeru Miyamoto's design of Ocarina of Time is intact. 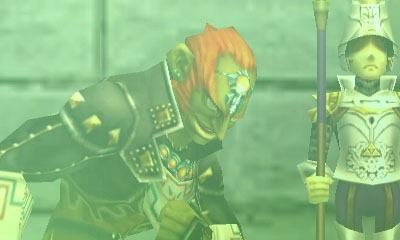 The weird dialogue from the denizens of Hyrule is just as charming. Fighting tektites and keese (bats to the layman) is still fun. 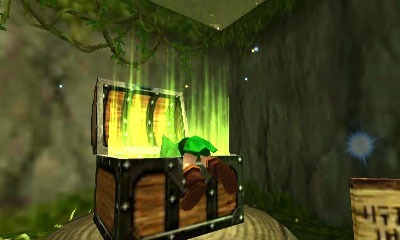 Discovering how to solve the puzzles in the dungeons still provides that thrill. 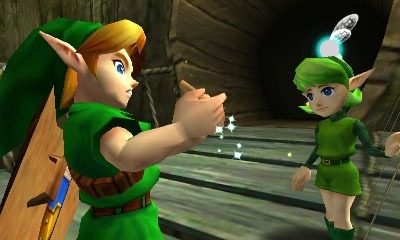 Link's fairy buddy Navi is just as annoying and helpful as ever. Using songs played on a music instrument is still one of the most innovative game mechanics ever created. 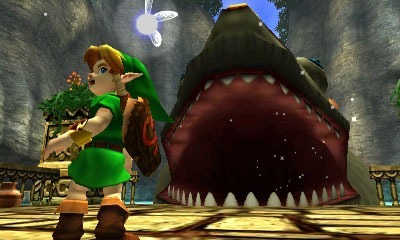 And exploring the somewhat open 3D world of Hyrule is just as engaging as it was when I first played it in my dorm room. But now it's actually 3D, and I'm not sure that adds much to the experience. Yes, the models and textures a bit prettier than the original must be, but the designers at Grezzo - the design house which helped Nintendo adapt this version - were smart enough to keep Ocarina feeling retro. The problem isn't the improved graphics; it's the fact that presenting such a vibrant 3D world only results in feeling nauseous. After the initial wow-factor, I mostly kept the 3D slider turned down lest I had to take a break hugging the commode. I assume that some people will be able to play in 3D without upchucking lunch, but the rest of us are left with a flat display that we could have gotten if we plugged in our old Nintendo 64. 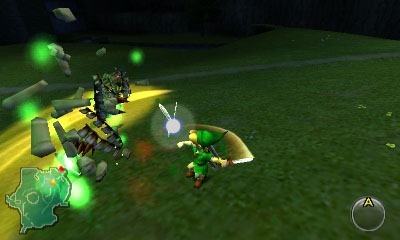 The Z-targeting system with the original was a breakthrough using Nintendo 64 controller's trigger button to lock onto a target, but trying to defeat monsters and especially bosses using the shoulder button of the 3DS is not fun for anyone who isn't double-jointed. The frequency with which Link must use the L shoulder button to reorient his view, or to target a monster, all while constantly moving to avoid attacks means that you must train your hands to move in ways they might not be familiar. I realize that the shoulder button position is a limitation of the 3DS system and not the game itself, but maybe the designers could have mapped that function to a different input or come up with a better way to target enemies.